Hurricane Miriam continues to track north through the Central Pacific Ocean and NASA's Aqua satellite analyzed the storm infrared imagery. On Aug. 31 at 7:15 a.m. EDT (1150 UTC) the Moderate Resolution Imaging Spectroradiometer or MODIS instrument aboard NASA's Aqua satellite found the coldest temperatures of the strongest thunderstorms Hurricane Miriam were southwest of the center and were as cold as or colder than minus 80 degrees Fahrenheit (minus 62.2 Celsius). They were embedded in a large area of storms where cloud top temperatures were as cold as or colder than minus 70 degrees Fahrenheit (minus 56.6 degrees Celsius). NASA research has shown that storms with cloud top temperatures that cold (that are very high in the troposphere) have the capability to generate heavy rain. 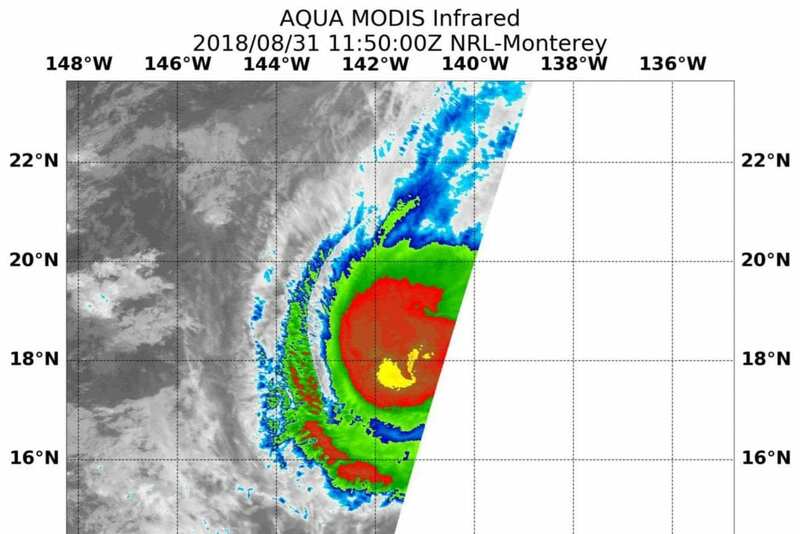 The Central Pacific Hurricane Center (CPHC) noted at 11 a.m. EDT (5 a.m. HST/1500 UTC), the center of Hurricane Miriam was located near latitude 18.3 degrees north and longitude 141.2 degrees west. That's about 910 miles (1,470 km) east of Hilo, Hawaii. Miriam is moving toward the north near 10 mph (17 kph). This general motion is expected to continue through tonight.